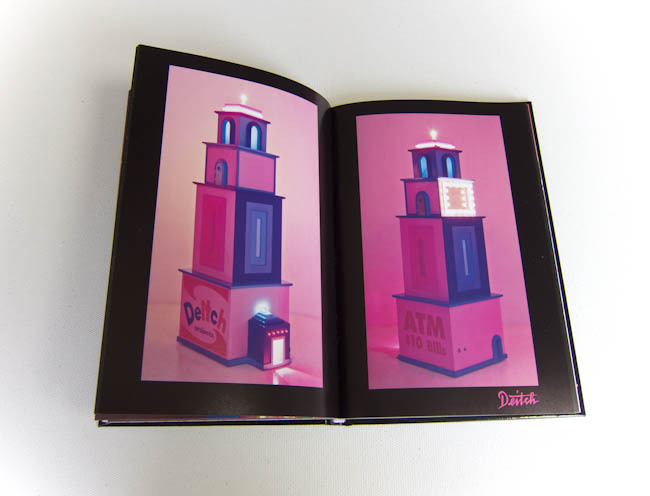 André Saraiva's new art book available through The Hole Gallery Shop. 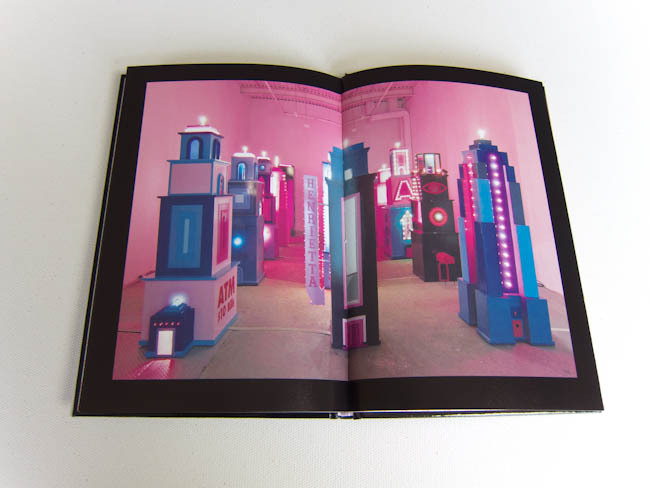 This book was from the first major solo show by André Saraiva “Andrépolis” (June 7 – August 10, 2012) where, as the title suggests, the artist will be making a miniature city installation in Gallery 3. Building fifteen wooden, painted, and fully lighted buildings, the rear gallery will be transformed into a city at night, with miniature neons lighting up his recreations of a hallucinatory vision of New York nightclubs and restaurants. His arted version of the city will create the scene for which artists and culture makers come together, while the sister show in Gallery 1 and 2 features portraits of over 100 of the artists that make up the art scene here. This exhibition, Andrépolis, is not only the most important exhibition that André has ever done in the United States, it is in fact the ultimate realization of his vision and of his artistic universe. The exhibition is an installation of fifteen monumental sculptures, forming an urban landscape composed of stylized New York skyscrapers. 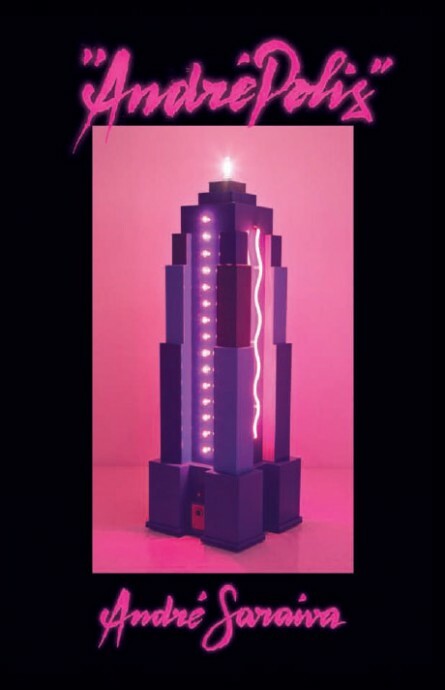 It evokes giant toys, a theme park, or perhaps miniature maquettes of nightclubs with their ever so discreet, well-guarded doors, their nocturnal, informational neons … Once again André is creating clubs, but this time they aren’t in a city, they’re in a gallery. With this good-natured gesture, he reminds everyone that if he did contribute to the night scene with his clubs— which he continues to do — it is as an artist, and without ever giving up his vocation, which renders clear everything he does. This exhibition synthesizes André’s artistic journey and his daily obsessions: the graffiti of Mr. A, drawn wherever he goes, love graffiti for each new love, and Mickey with his erection (“I have a Mickey Mouse/ a real club in his house. And if you shake him he goes off…” as Serge Gainsbourg used to sing, rather more pornographically in French), which André remade for the occasion, the silver exhibition. Ironically, these sculptures of nightclubs also link to his activity as a creator of clubs. Each of these sculptures is an altar to the passions in his life: partying, the night, and the irresistible attraction of the lights in the bars and the clubs of the city he is exploring. And the exhibition has a surprise at the end, a carousel for adults, for those who are not afraid to ride the wings of desire… the way André does in Andrépolis.